for all ages for Fall 2017. ​Already know which workshop you want to take? Course offerings for ages 15 to 115. 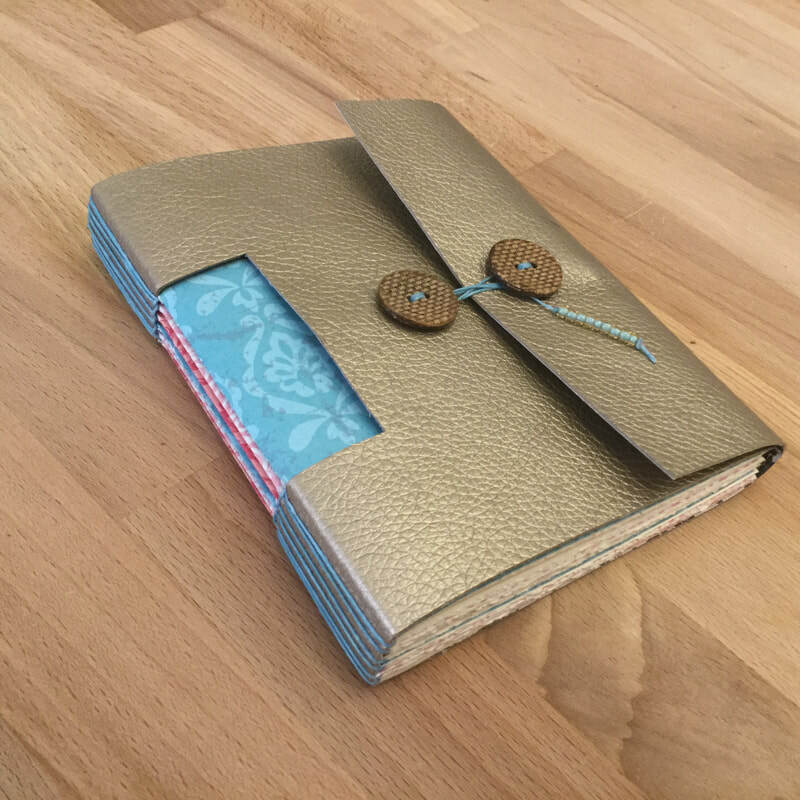 Learn to make your own blank, soft cover book with this simple bookbinding stitch that creates pages that lie completely flat, handy for journaling, sketchbooks, or photo albums, and makes a sturdy, solid book. 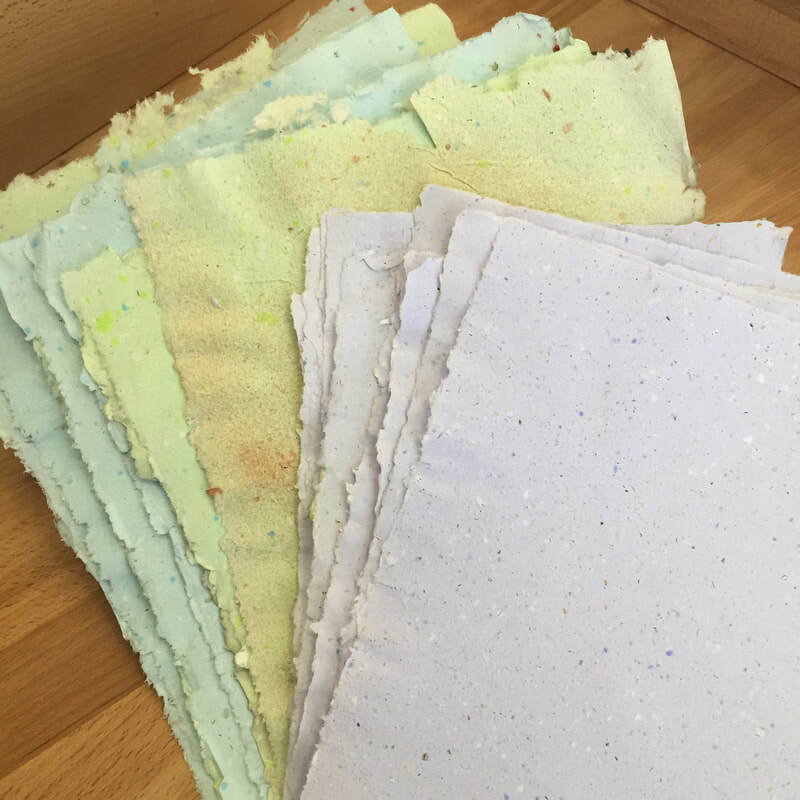 In this workshop, we will use completely upcycled materials for the pages—old maps, painted recycled office paper, brown grocery bags, and more (including your own handmade upcycled paper, if you attend our Upcycled Papermaking workshop the weekend before! )—and cover of the book (old blue jeans, felted sweaters, etc.). 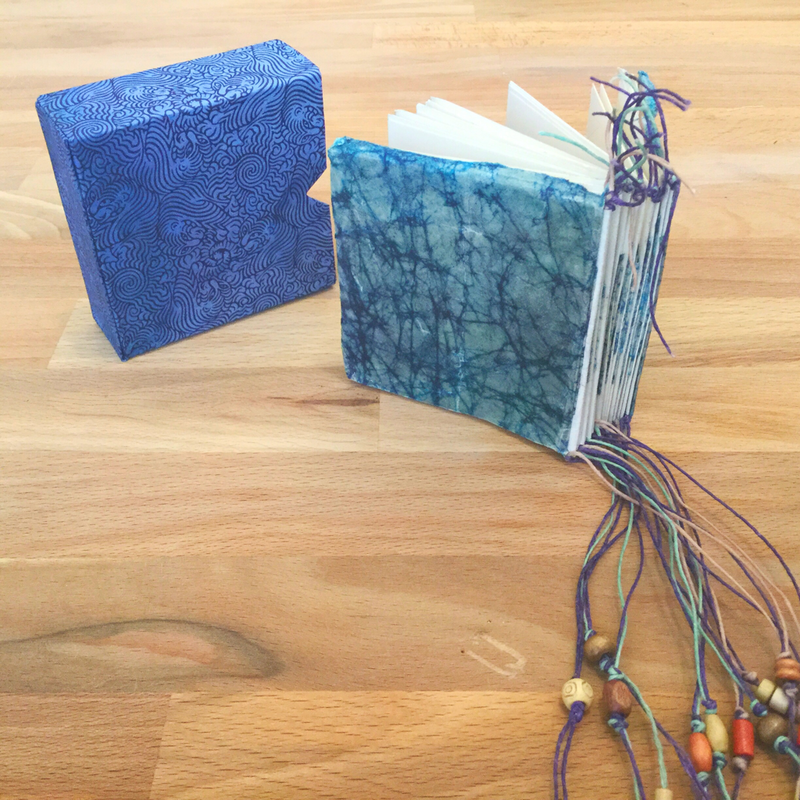 Because of the variety of materials used, these make great art journals! 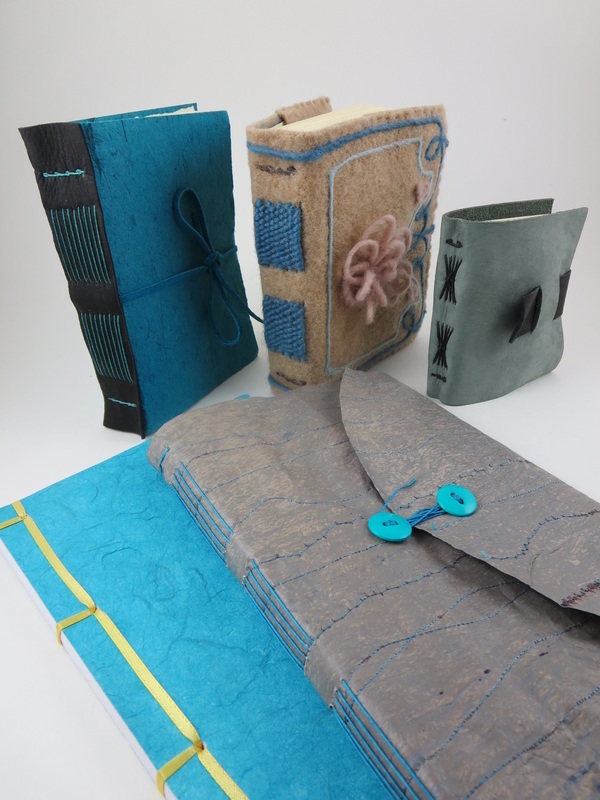 All bookbinding tools and materials will be provided for your use in the workshop, but feel free to bring any materials you wish to upcycle for use inside the book or as your cover. You’ll go home with one completed blank book. Appropriate for all levels. Saturday, September 23 – 1 p.m. to 4:30 p.m. Learn to make your own blank, soft cover book with this basic but beautiful bookbinding stitch that creates pages that lie completely flat, handy for journaling, sketchbooks, or photo albums. We’ll learn a unique twist on this classic stitch, as well. You will take home one soft cover book with a faux (or real!) leather cover. All bookbinding tools will be provided for your use in the workshop. Appropriate for all levels. Saturday, September 30 – 1 p.m. to 4 p.m.
Come learn this playful stitch that can be used with various covers to create a book that lies open flat, making it easy to write or draw in. 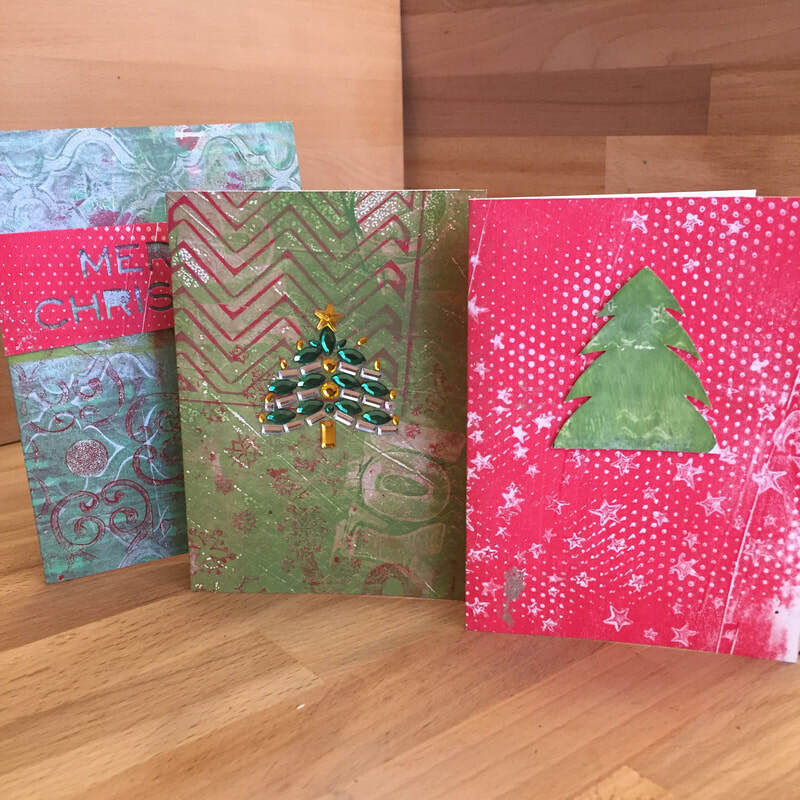 In this workshop, you will make and take home one book with a soft vinyl or leather cover, using fun decorative papers to enhance the peek-a-boo window to the book’s spine, and a button closure. All tools and materials will be provided for your use in the workshop. Appropriate for all levels. 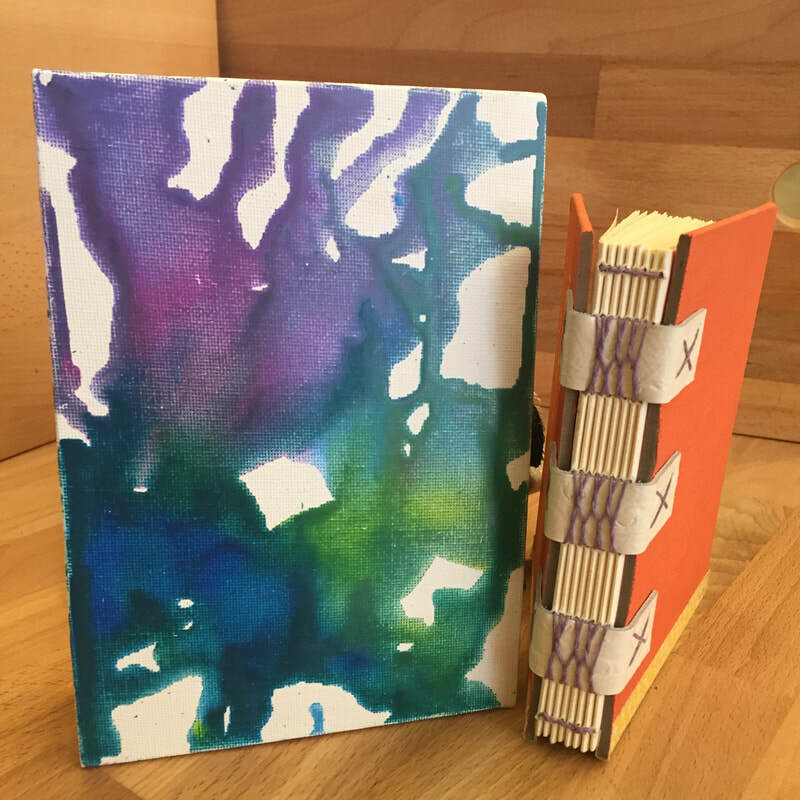 Saturday, October 21 – 1 p.m. to 4 p.m.
Come learn this unique binding method that makes a highly decorative little book. Different from the other kinds of binding stitches we cover, this book leans more towards an art book, but also makes an excellent book for displaying photos or special sentiments. Then you’ll make a smart little slipcase to contain your book. All bookbinding tools and materials will be provided for your use in the workshop, and you’ll go home with one completed book and slipcase. Appropriate for all levels. Saturday, November 4 – 1 p.m. to 4 p.m. Learn to make your own blank, hard cover book with this classic exposed spine bookbinding stitch that creates pages that lie completely flat. This is one impressive bookbinding stitch! 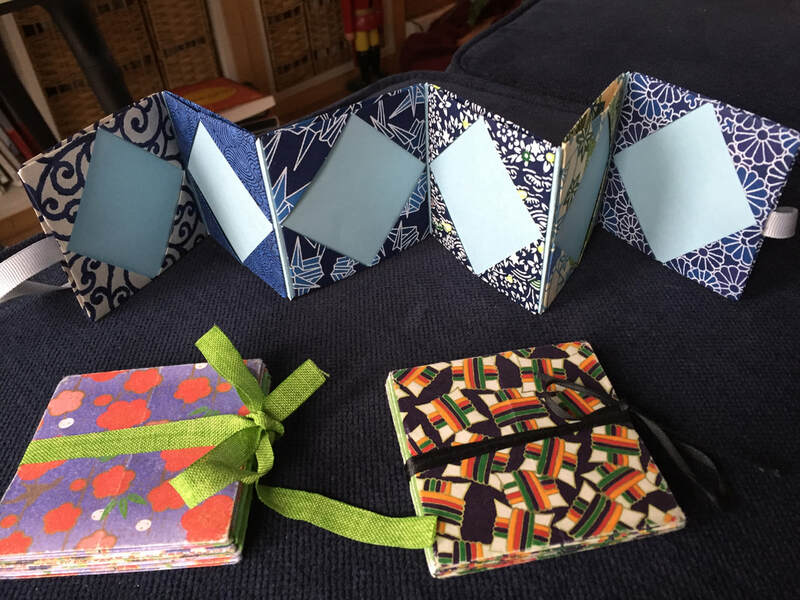 In this workshop, you will make one adorable little book (two, if we have time). All bookbinding tools will be provided for your use in the workshop. Appropriate for all levels. Saturday, November 18 – 1 p.m. to 4 p.m. Learn to make your own hard cover book with this highly decorative stitch, which allows the book to lie completely flat, making an excellent surface for writing or drawing. 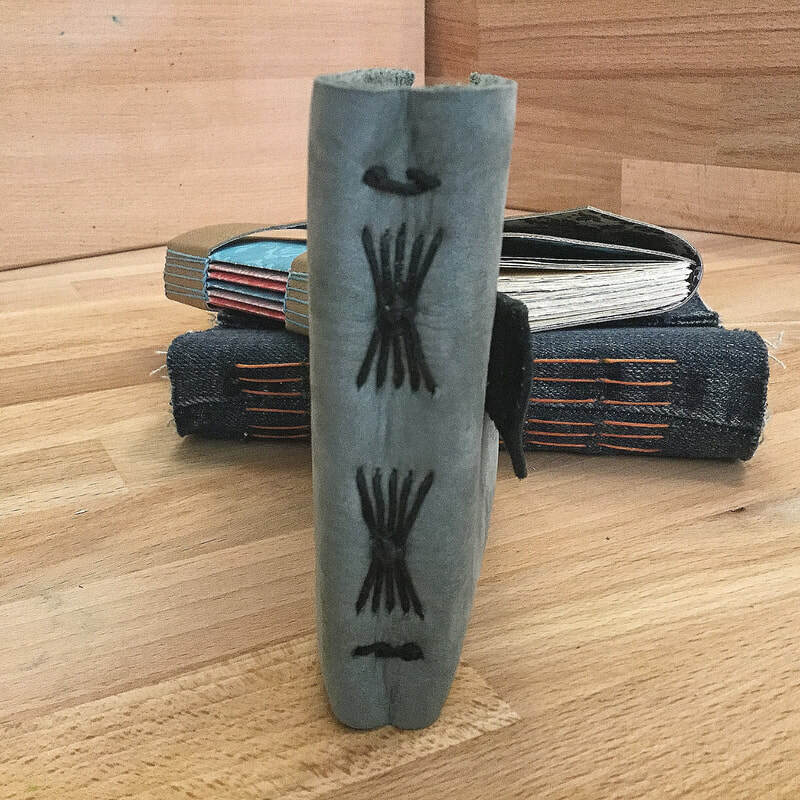 You’ll use a cover you design and create yourself with melted wax to create a hard cover book with leather hinges on the spine. All bookbinding tools and materials will be provided for your use in the workshop. Appropriate for all levels. Saturday, December 16 – 1 p.m. to 4:30 p.m.
Join us as we share our special New Year tradition with you—crafting this unique folded book to fill with your most precious life intentions, which you can then carry with you through the year as a reminder of your highest and best goals. All bookbinding tools and materials will be provided for your use in the workshop, and you’ll go home with one completed intention book, ready and waiting to be filled. Appropriate for all levels. 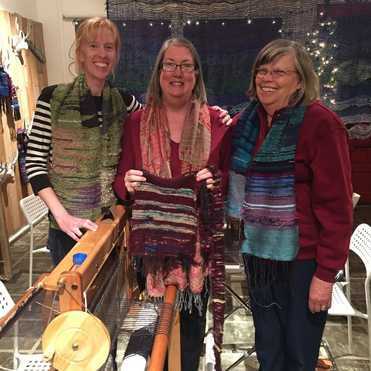 Saturday, December 30 – 1 p.m. to 3:30 p.m.
Express yourself through your weaving, then carry it around with you! During the first session, you’ll weave the fabric for your tote bag on our easy-to-use floor looms, where you’ll be encouraged to express yourself through your use of yarn and techniques. In the second session, you’ll add a lining, explore different ways to make straps, and sew your bag together. Appropriate for all levels of weavers, including brand new! ***THIS IS A 2-SESSION COURSE. 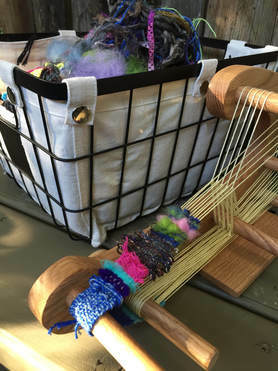 Free yourself and exercise your creativity at this fiber playtime on a small, portable loom called an inkle loom, then craft your weaving into a camera strap, key fobs, or barrettes (more than one, if time permits). All tools and materials will be provided for your use during the workshop. 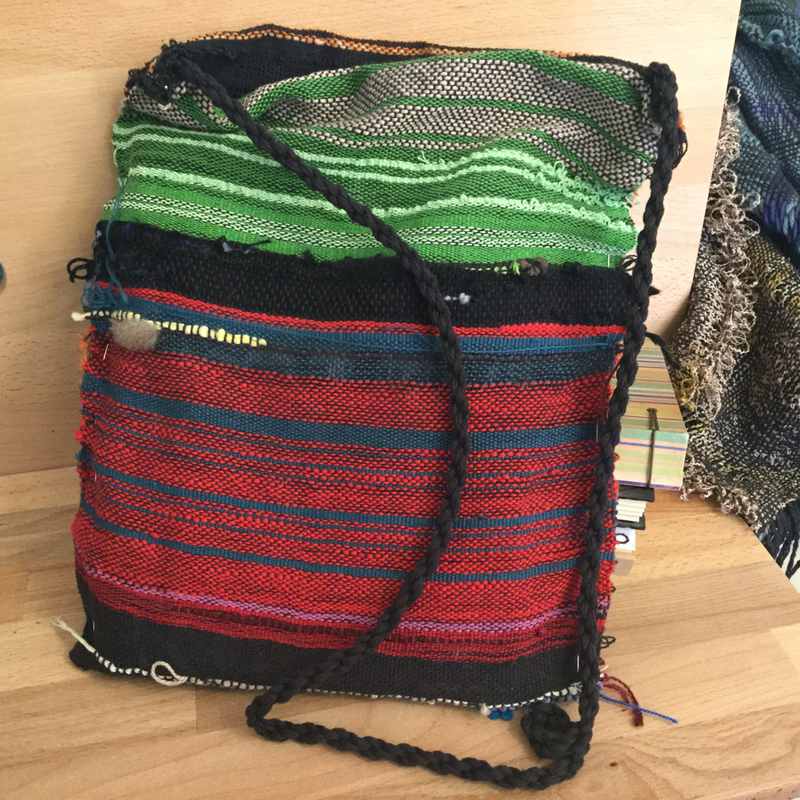 (If you have your own inkle loom, or fun “treasures” to add in, feel free to bring them!) Appropriate for all levels—even brand new weavers! Saturday, October 28 – 1 p.m. to 4 p.m.
Weave a small piece of fabric on our easy-to-use floor looms, in the freestyle way—no rules, no mistakes, no patterns! 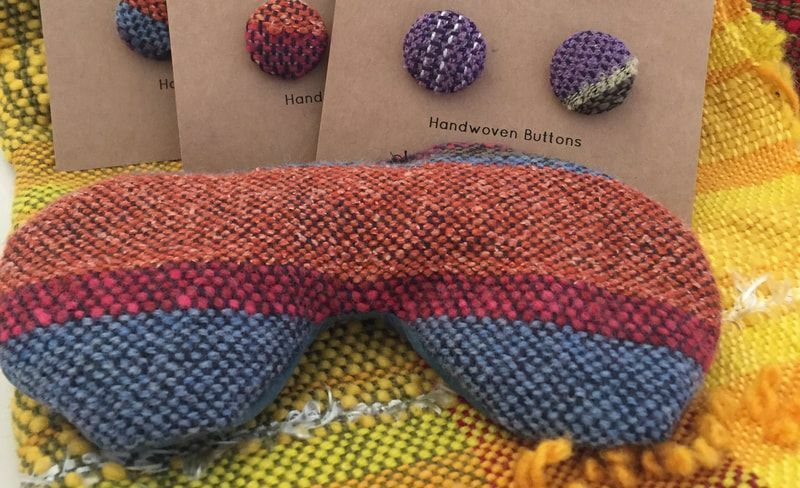 Then fashion your fabric into a glasses case or eye pillow (more than one, if time permits)—easy weaving, easy sewing! All tools and materials will be provided for your use during the workshop. Appropriate for all levels. Saturday, December 9 – 1 p.m. to 3 p.m.
Macramé, that 70s staple, has been experiencing a resurgence lately—a good thing considering how accessible it is, as a craft that does not require expensive tools to get started. 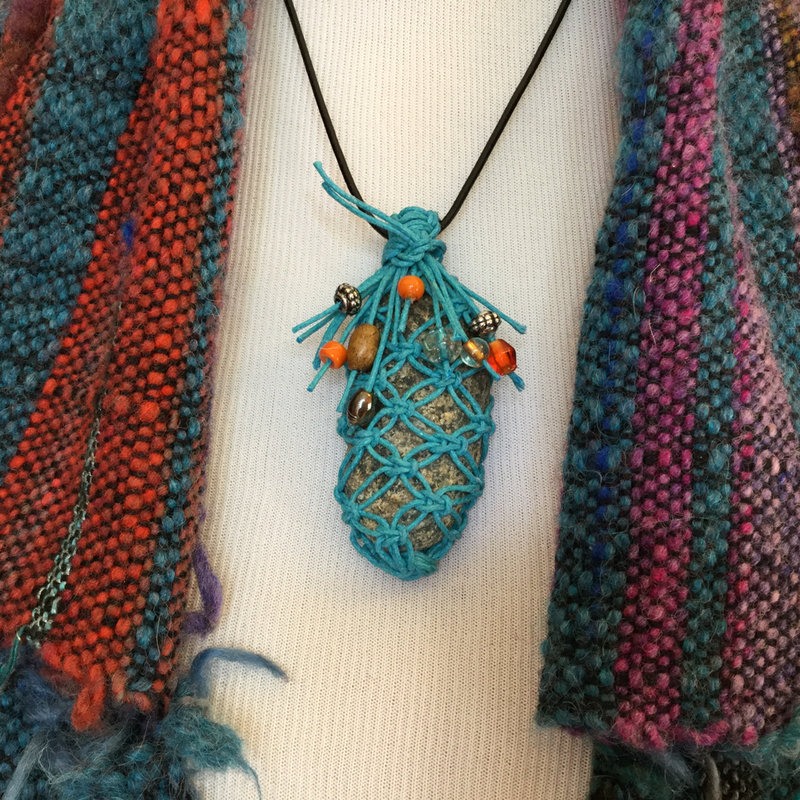 You’ll work with waxed cotton cord to make a macramé pebble pendant that you’ll take with you at the end of the workshop. All equipment and tools will be provided for your use during the workshop. This should be an excellent starter project for those new to macramé, or a great refresher for those who’ve been away from it for a while. As such, it is appropriate for all levels. 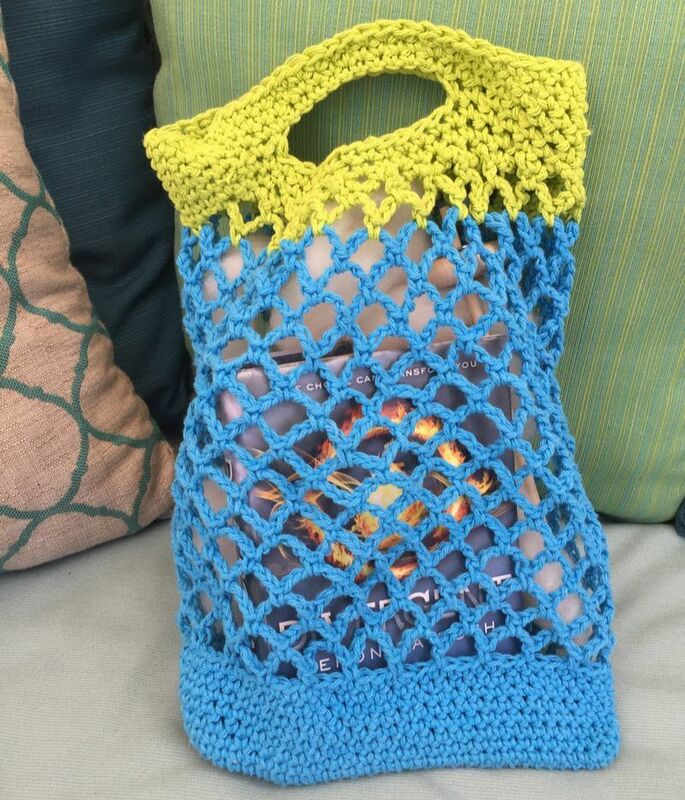 Sunday, September 10 – 1:30 p.m. to 4:30 p.m.
Come learn basic crochet skills while you create a mesh market bag to take home. Get familiar with the tools, techniques, the three most basic crochet stitches (chain stitch, single crochet, slip stitch), which you can use to make beautiful hats, scarves, blankets, and more, and how to read patterns. All tools and materials will be provided for your use during the workshop, but we encourage you to purchase your own size “H” crochet hook, so that you can continue on after the workshop is over. Appropriate for brand new to beginning crocheters. Mondays, September 11 & 18 – 6 p.m. to 8 p.m.
Kumihimo is a Japanese form of braiding that allows you to create long, intricately woven cords that can be used for anything from shoelaces to jewelry. 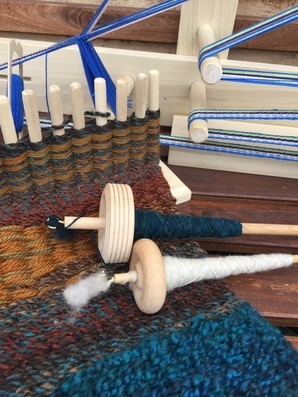 In this two-session workshop, we will explore the use of both a handheld foam disk and the more traditional maru dai (braiding stand) to create braided pieces. All materials and tools will be provided for your use in the workshop. Appropriate for beginners. Mondays, October 23 & 30 – 3 p.m. to 5 p.m. 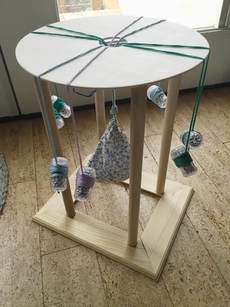 Learn how to make your own yarn using a simple drop spindle and some wool fiber. 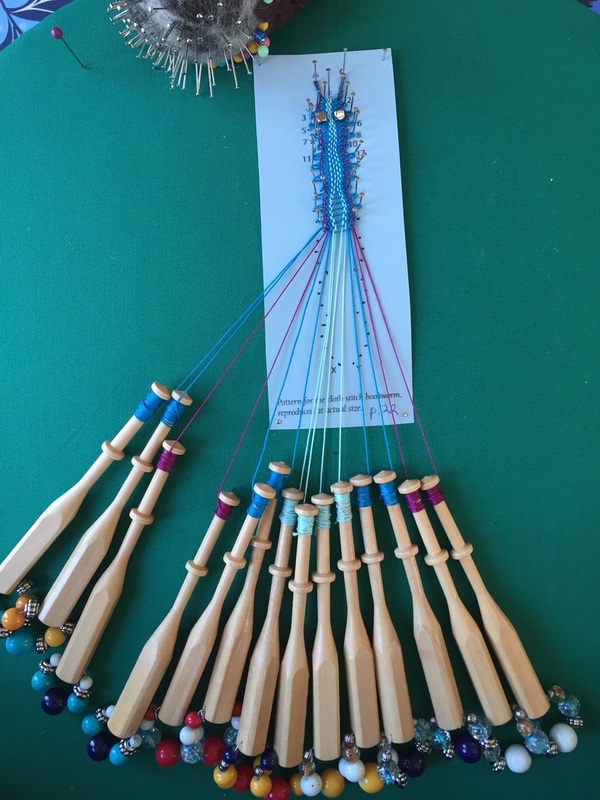 We will also explore plying two singles together, discuss how to finish your yarn, and learn about different kinds of spindles and yarn. All tools and equipment will be provided for your use in the workshop. 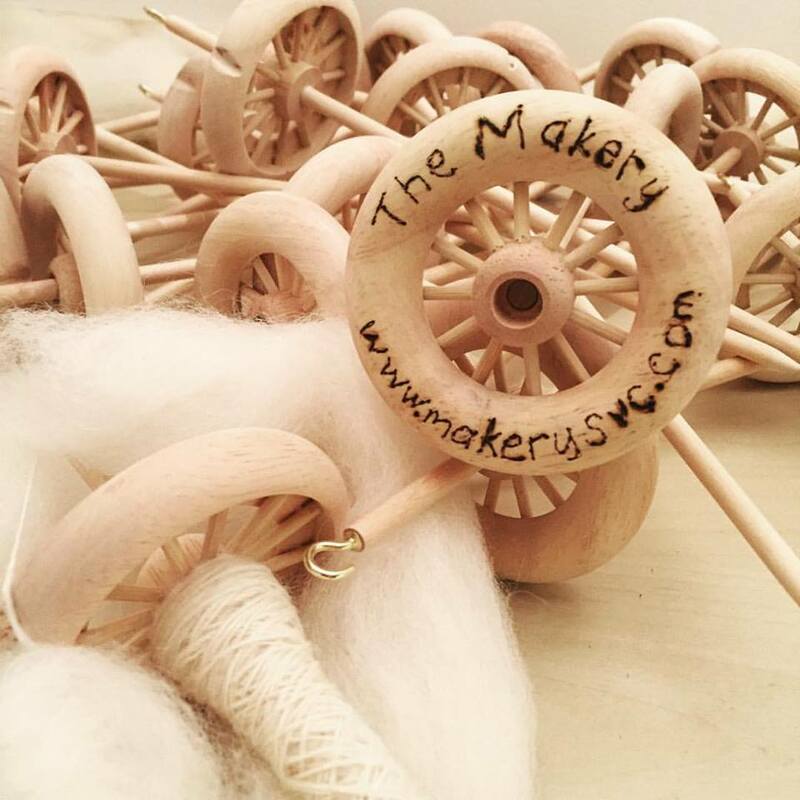 (If you have your own spindle, feel free to bring it to the workshop!) Appropriate for all those new to spinning on a drop spindle. Thursdays, November 2 & 9 – 2 p.m. to 4 p.m.
Have you ever thrown a wool sweater in the washer/dryer and come out with a shrunken mess? Don’t throw it out—use it to create something awesome! What you’ve done is called “fulling” (commonly thought of as felting), and we can do this on purpose to get some lovely, sturdy fabric, which we can easily cut apart and sew up to make useful and beautiful items. 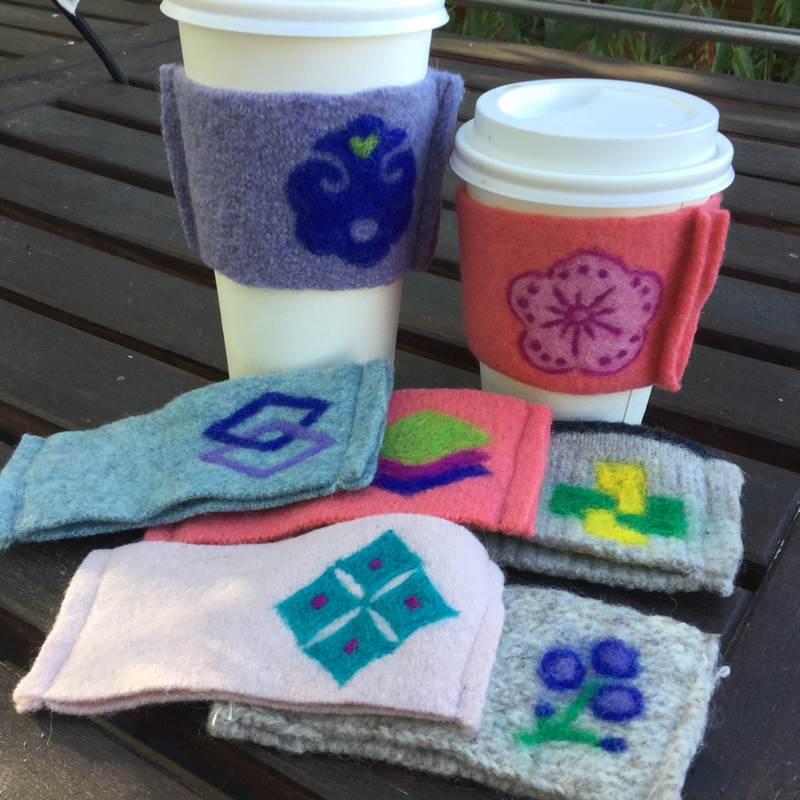 In this workshop, we’ll discuss how to full products made of protein (animal) fibers, then we’ll cut some pre-fulled items up to make delightful little gift items, such as cup cozies for your take-out hot beverage cups (a stylish and eco-friendly replacement for the cardboard sleeves you normally get), handwarmers (filled with rice, which can be warmed up in the microwave over and over again), or sturdy yet soft cases for phones or tablets (or more than one, if time permits). Then you’ll learn how to needle-felt a design onto your freshly minted item. All tools and materials will be provided for your use during the workshop. Appropriate for all levels. Saturday, November 11 – 1:30 p.m. to 3:30 p.m.
Come learn how to use old office paper you would normally just recycle to make beautiful new paper. We’ll go through the whole process from start to finish, and you will leave with several sheets of paper, perfect for use as stationery (or in next week’s Upcycled Book workshop!). All equipment and materials will be provided for your use during the workshop. Making paper is a wet, outdoor activity, so please come prepared to work on our shaded back patio. Appropriate for all levels. 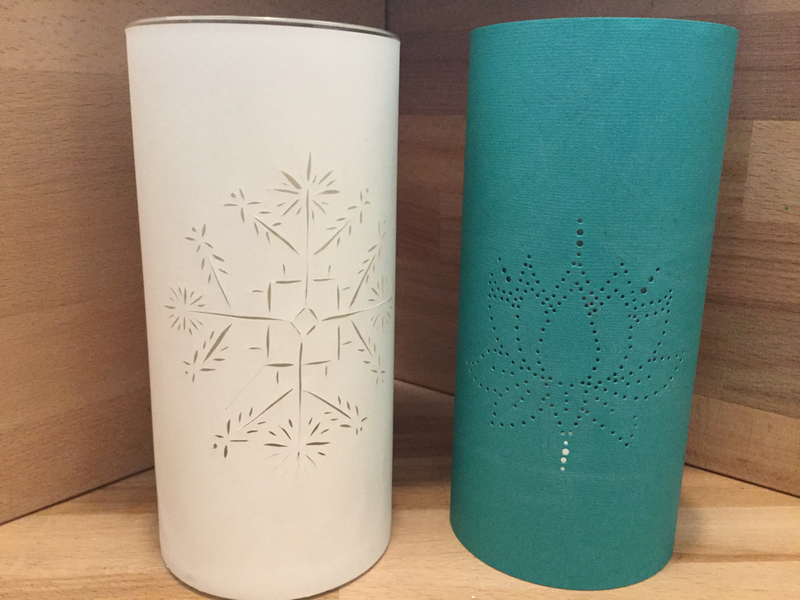 Saturday, September 16 – 1 p.m. to 4 p.m.
Come design and create your own lighted votive holders, perfect for setting out during the holidays or year-round, lending your own unique personality to your home decor. They also make the perfect gift for the holidays! 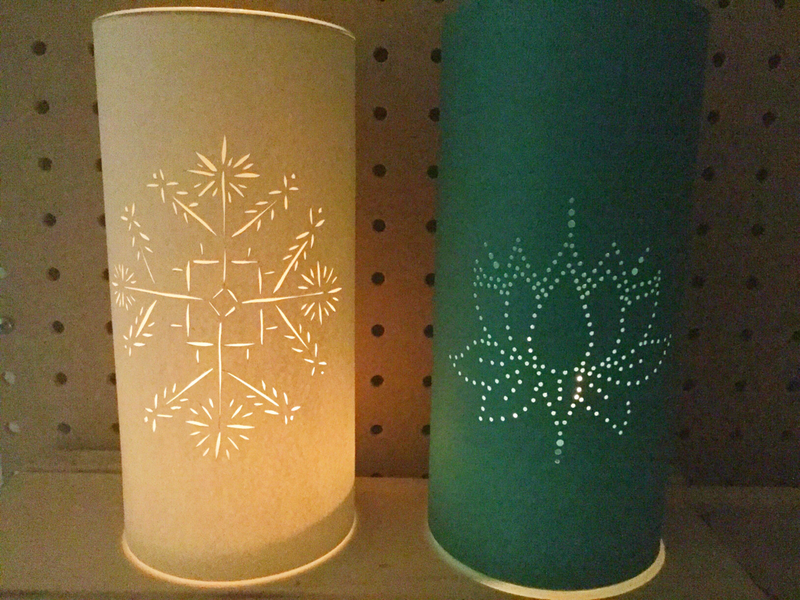 You'll cut or pierce paper to cover a glass votive holder, then light it with a candle or LED lights, and go home with your very own cut or pierced votive holder (two, if time permits). All tools and materials will be provided for your use in the workshop. Appropriate for all levels. 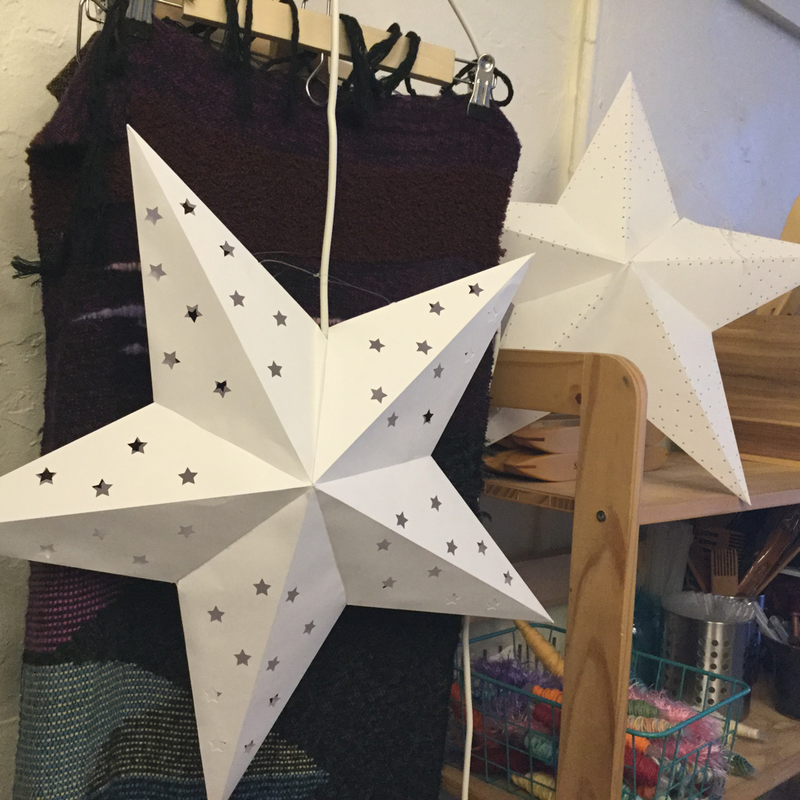 Saturday, November 11 – 11 a.m. to 12:30 p.m.
Join us as we cut, fold, glue, and pierce paper to create a beautiful star-shaped lantern, perfect for hanging during the holiday season, or giving away as a gift. You’ll go home with your very own hand-crafted paper lantern. All tools and materials will be provided for your use in the workshop. Appropriate for all levels. Saturday, November 25 – 2 p.m. to 4 p.m.
Saturday, December 9 - 3 p.m. to 5 p.m. Send out some truly unique holiday cards this year—handcrafted by you! We’ll make some awesome prints first, using our super-fun Gelli plates, then turn them into cards, for the holidays or for any occasion! All tools and materials will be provided for your use in the workshop. Appropriate for all levels. Saturday, December 2 – 1 p.m. to 4 p.m. 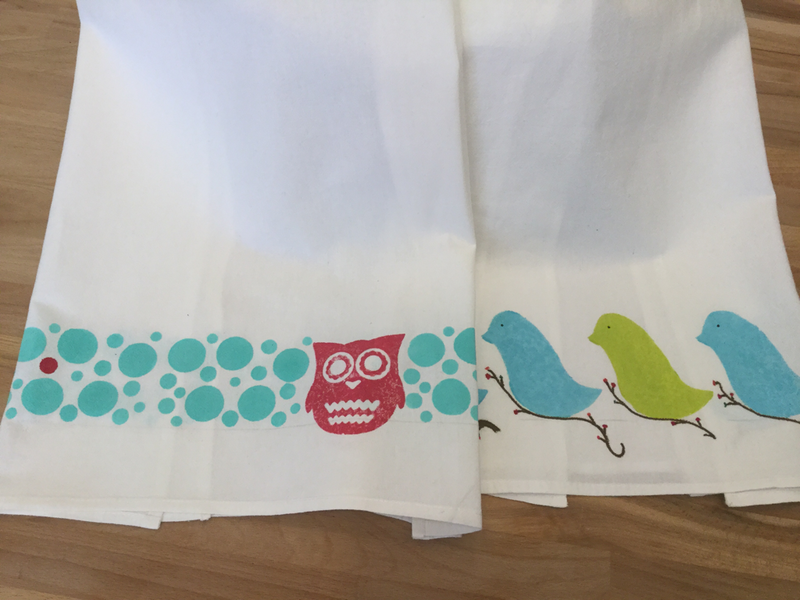 Create and take home a pair of one-of-a-kind cotton tea towels using your choice of fabric printing methods and tools, including stamps, stencils, and freehand. All tools and materials will be provided for your use in the workshop. Appropriate for all levels. 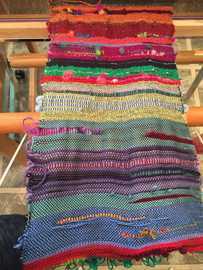 Saturday, December 23 – 1 p.m. to 3 p.m.
Freestyle weaving on our big, easy-to-use floor looms—no rules, no mistakes, no patterns, just fun! Use old maps, grocery bags, office paper, blue jeans, sweater, and/or old billboard material to make an awesome new book! 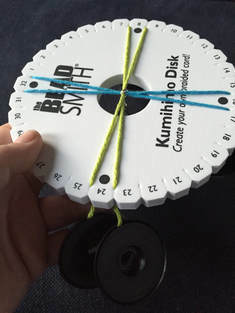 Learn this Japanese form of braiding using a handheld foam disk to make beautiful braided keychains. ***Great holiday gift idea! Make your own marbled cards to give away—for the holidays, or just because! 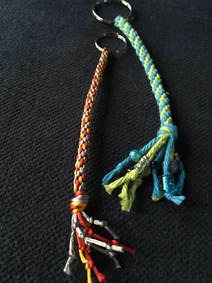 Come play the freestyle way on our little inkle looms and make a keychain to keep or to give away! Spend some time making amazing prints with a Gelli plate, then choose one as the cover for your Japanese stab-bound notebook. Click here to print a one-page, chronological version of our Fall 2017 Workshop Schedule. See a workshop you’d like to take, but the timing doesn’t work for you? Find two (or more—up to 6 to 9 total, depending on the workshop!) friends to take it with you and we can arrange to teach any workshop in our catalog at a time convenient for you. There is a minimum charge, based on three people taking the workshop, and an additional per-person fee above three people—these are exactly the same as our regular workshop rates. Fees depend on the particular workshop, and all fees are paid in advance. See our full Workshop Catalog here for a listing of our offerings. Then contact us to set up a workshop time. It’s that simple. Join us — we look forward to being your creative outlet! During the school year, every Thursday – 4 p.m. to 5:30 p.m.
During the summer, every Thursday – 10 a.m. to 11:30 a.m.
Join us for our regularly scheduled Walk In & Weave freestyle weaving instruction three times weekly, for all ages—adults and kids, alike. Come once, or come as often as you'd like! 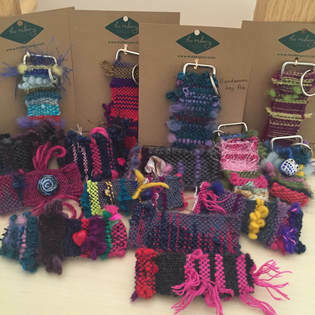 If you’ve never woven before, consider Walk In & Weave to be your “Introduction to Weaving” class. C You can be weaving on your own with about five minutes of instruction. If you have some (or a lot of!) experience weaving, consider Walk In & Weave to be your time to just relax and weave, or to explore some new techniques that you find on our in-studio samplers. We do the hard part of weaving for you—warping, or setting up, the loom! Choose from any of our great variety of yarns. Take your finished piece home with you at the end of the two-hour session. Pre-registration is not necessary—simply show up at the regularly-scheduled time that works best for you. (However, if you want to reserve a loom during a specific time, just email or call us to let us know you are coming.) To get the most out of your two hours, please be sure to arrive by the starting time of each session. For more information about Walk In & Weave, click here. 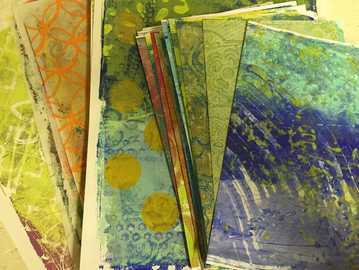 Join us the first Saturday morning of each month for some creative play using Gelli plates to make beautiful and unique prints on paper, cardstock, and fabric. These can be used in mixed media projects, on greeting cards or in scrapbooking, or to embellish other items such as photo mats. Gelli plates are playful, creative things—very little instruction is required, and this “play-date” is all about having fun while using our vast array of tools, paints, and papers. Watch for our occasional Girls' Night Out events. Check our home page or our Parties & Events page to see what's coming up! Have you take a bookbinding workshop at The Makery, then never made a book again because you don't have the tools you need? Then we have just the thing for you! 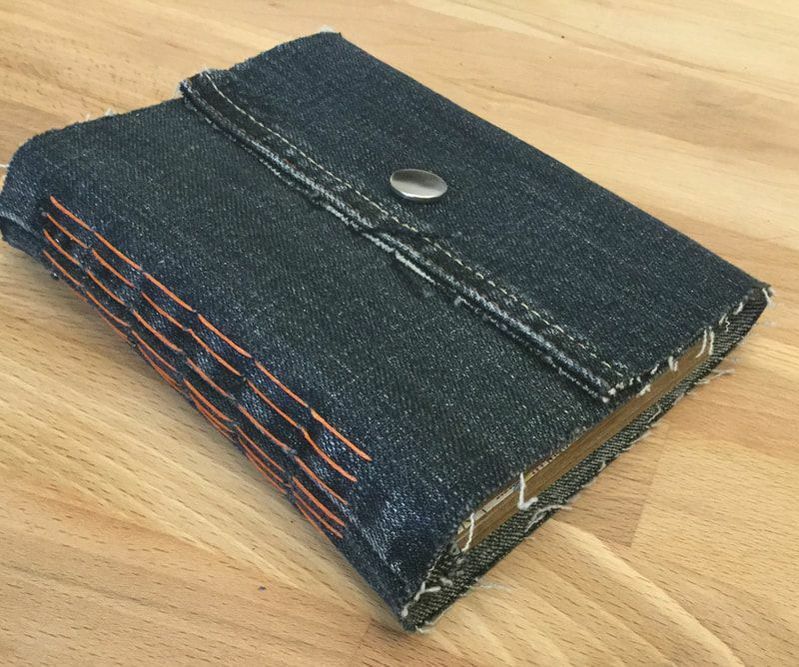 We are now offering a weekly Open Bookbinding Studio anytime we have a scheduled Walk In & Weave time. Here you will be able to use any of our bookbinding tools, and someone will be here to offer advice and assistance, as well. The cost will be $10 for up to the full two hours (come as little or as long as you want within that two-hour time period). We'll also have supply kits (cover material, paper, binding thread) available if you'd like to use those materials to make your book, or you can bring your own. Please note that this will not be a time for basic bookbinding instruction--it is meant for people who have completed a bookbinding workshop at The Makery, or who can otherwise demonstrate basic competence in bookbinding. There is no need to pre-register, but if you think you will come to Open Bookbinding Studio but will not be able to be there right at the beginning of the session,please call, text, or email me to let us know you are coming. We will also soon have bookbinding kits for sale, that will provide all of the basic tools you need to make books on your own! To help us prepare for your creative workshop, please register at least one day before the first day of the workshop. Stop by our studio at 108 West Yankie during our open hours (Thursday to Monday, 11 to 4). 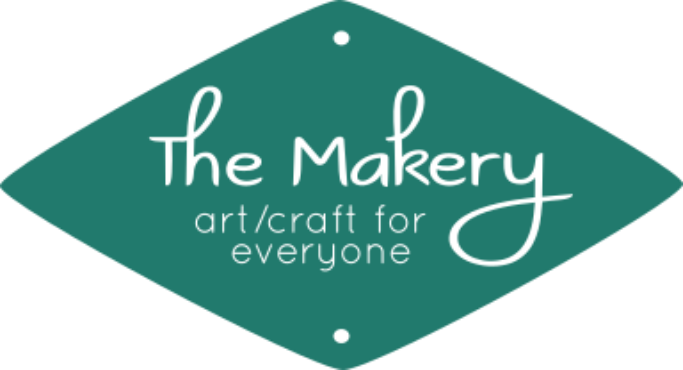 All workshops take place at The Makery, 108 West Yankie, in Silver City. We will provide all tools and materials for use in the workshop (unless otherwise noted)--you supply your own unique sense of beauty! Our goal is to make the world of art/craft accessible to everyone, of all ages, genders, backgrounds, and abilities. We teach you the basics, then encourage you to let loose and have fun with it, whether it's freestyle weaving, or any number of other more traditional handcrafts. We believe that every individual has their own sense of beauty and spark of creativity, and we want to create a nurturing space where you can gain the basic skills, then feel comfortable to express that creativity in your own way. No rules, no mistakes--just joyful creation from the heart! 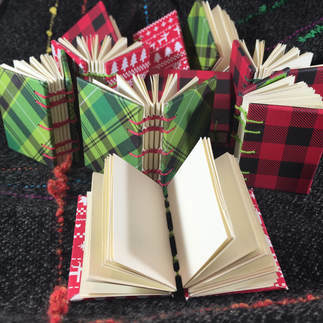 Various bookbinding techniques, such as Coptic stitch, secret Belgian, stab binding, folded books, long stitch, buttonhole stitch, and pamphlet stitch. ​We will provide tools and materials for use in your workshop--you supply your own unique sense of beauty! We also offer Creative Camps in the summer. In addition, we offer individual and group instruction in freestyle weaving, arranged ahead of time, or on a drop-in basis during our Drop-In Weaving times. Want to do something different for your next special occasion? Plan your next party at our studio, and unleash your creative side with your friends! Watch for our special events, coming soon! We'll plan special nights out where we do the hard part, and you come and have the fun of creating something new. ​keep you updated on our current schedule of open studio times, workshops, camps, and special events. ​For the most up-to-date information, follow us on Facebook.